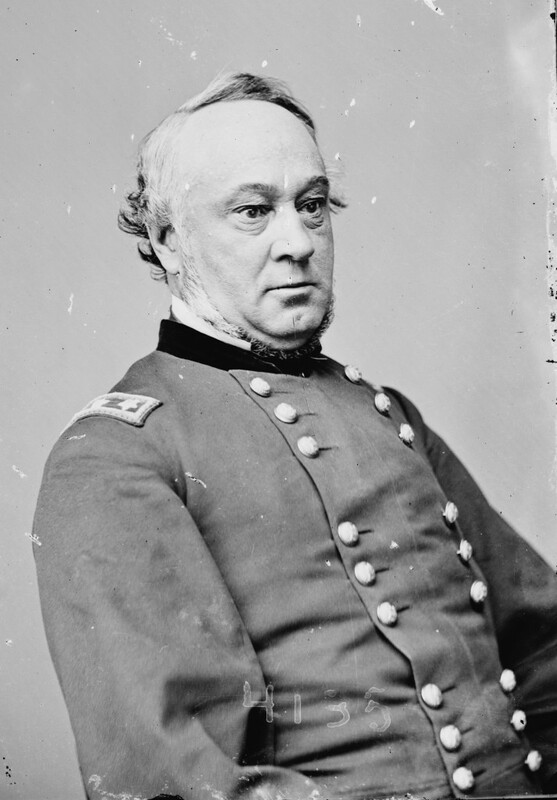 Henry Halleck was born in Westernville, New York, on 16 January 1815. He was educated at Hudson Academy, and received a Bachelor of Arts degree from Union College. He then graduated from the U.S. Military Academy in 1839 and was commissioned in the Corps of Engineers. Halleck delivered a series of lectures which were eventually published under the title Elements of Military Art and Science. During the Mexican War, he translated the military philosopher Henri Jomini’s Vie politique et militaire de Napoleon. Halleck saw action during the war in California and held various staff positions. Resigning his commission in 1854, Halleck married Elizabeth Hamilton and practiced the law for two years. Then, he became president of the Pacific and Atlantic Railroad, a director of the New Almaden Quicksilver Mine, and returned to military service as a major general of California militia in 1860. The next year, Halleck was reappointed in the Regular Army, with the grade of major general. He commanded the Department of the Missouri and then the Department of the Mississippi. He led the Union forces during the Corinth campaign before he became the commanding general of the Army on 13 July 1862. He served as commanding general until 9 March 1864, when he was designated as the chief of staff. Later in the war and afterwards, he commanded the Division of the James, the Division of the Pacific, and finally the Division of the South. Halleck died at his headquarters in Louisville, Kentucky, on 9 January 1872.